St Pierre Marriott Hotel & Country Club Golf at St Pierre Marriott Hotel & Country Club01291 625261work Golf - 18 holeMarriott St. Pierre is built around a beautiful 14th Century Manor House set amidst 400 acres of tranquil parkland including two 18-hole golf courses. Additional golf facilities include a 13 bay floodlit driving range, a video room, putting and chipping greens and shop. The extensive leisure club offers a fully equipped gym, dance studio, swiming pool, sauna, steam room, jacuzzi and health and beauty suite. There are 148 bedrooms and the 11 conference rooms can accommodate 2 - 240 delegates with beautiful views of the surrounding grounds. Marriott St. Pierre is built around a beautiful 14th Century Manor House set amidst 400 acres of tranquil parkland including two 18-hole golf courses. 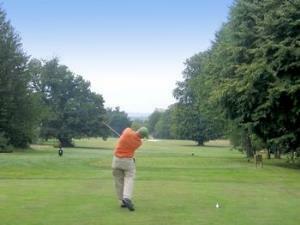 Additional golf facilities include a 13 bay floodlit driving range, a video room, putting and chipping greens and shop. Marriott St. Pierre is just off junction 21 of the M4 and is only 2 hours from London, 1 hour from Birmingham and 20 minutes from Bristol.